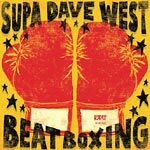 If you're looking for 23 fresh gems to vibe with, then Supa Dave West has got you covered with, Beat Boxing. Simply put, SDW is a producer that's mastered the art of putting the boom in the bap. Though fans may have first tuned in to the sounds of the former Jamaica, Queens drummer / beatsmith with his production contributions to De La Soul's catalog over the years, on tracks like ''Bionix,'' ''Baby Phat,'' ''Watch Out,'' ''The Grind Date,'' and many more, that's just scratching the surface. With recent credits that include ''The Doe'' and ''No One's Home'' from J Dilla's Give Them What They Want maxi-single (to be featured on the late producer's album, The Diary), as well as various tracks with the likes of Talib Kweli, Common, Slum Village, Planet Asia and Ghostface Killah, SDW has aligned himself with some of the best to ever do it. The beauty of Beat Boxing lies in its ability to act as an ambitious, well rounded project that is well rooted to the foundation of the craft, while also venturing into new territories. Instead of seeming thrown together, Boxing comes across as a meticulously planned construct. Its scattered, unexpected drums bear production sensibilities resemblant to Dilla, and the sound coming out of The Ummah's production camp at the time, while being unique enough for people to get a sense of what West is all about. Supa Dave West's Beat Boxing has received co-signs from The Source, XXLMAG, Egotrip, Mass Appeal, Okayplayer & 2Dopeboyz, to name a few, and for good reason: his music is awesome.